Have you had your fair share of pink ballet suits and are you just so ready for a change? Then this ballet suit pattern is for you. Choose a colorful knit with a special print and show all those clothing stores how daughters of makers dance! Going to dance class doesn’t have to be boring clothing wise. Let’s show all those clothing brands and their pink and white ballet suits what makers can do. Choose high quality fabrics with bright colors and fun prints to make your daughter’s dream ballet suit. The pattern includes both long and short sleeves and features a deep neckline with no closures. You can add a tulle or jersey skirt. This pattern was originally published in german by erbsenprinzessin and is here sold in its english translation. Sizes included are european sizes 92-152 or approx. 2-12 years. The pattern contains a size chart. Bi-elasitc Knit fabrics with a high stretch percentage and very good recovery, i.e. stretch jersey, lycra, etc. The pattern includes instructions, recommendations on fabric and notions, fabric requirements, a size chart, sewing tips, instructions on printing and of course the pattern itself. The pdf includes 14 pages (6 pages manual, 8 pages pattern sheet). 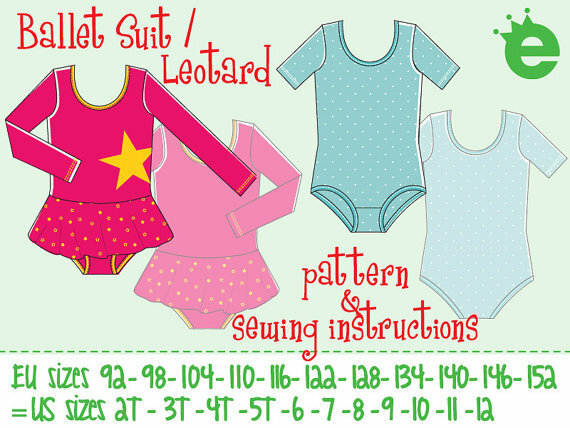 Please note that this purchase is for a pdf home sewing pattern of the “Ballet Suit” (not the actual garment). Upon purchase you will receive an email to download the pattern.